Tomorrow's Paris is emerging around it. 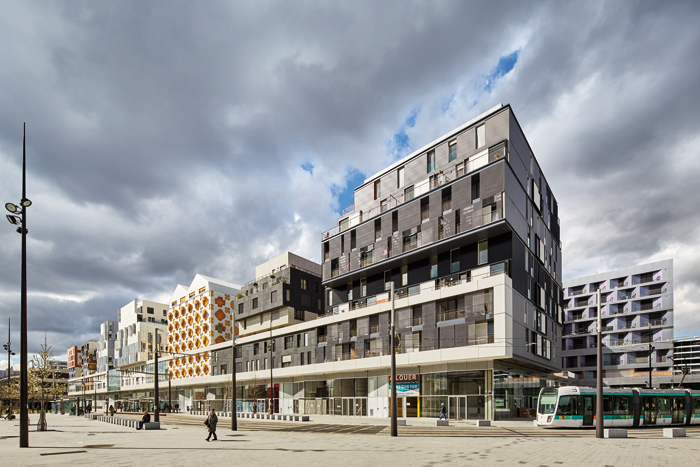 The city is building where it transitions towards the great ring expressway of the Boulevard Périphérique, beyond which lie other municipalities in 'les banlieues'. This is edge territory, spatially and economically. Around this ring is a new Paris, from the new Avenue de la France in the thirteenth arrondissement to Renzo Piano's 160m-high Palais de Justice under construction in the seventeenth, and a new tram line arcs around half the circumference. The latest addition is the Entrepôt Macdonald, at the north-eastern nineteenth arrondissement. 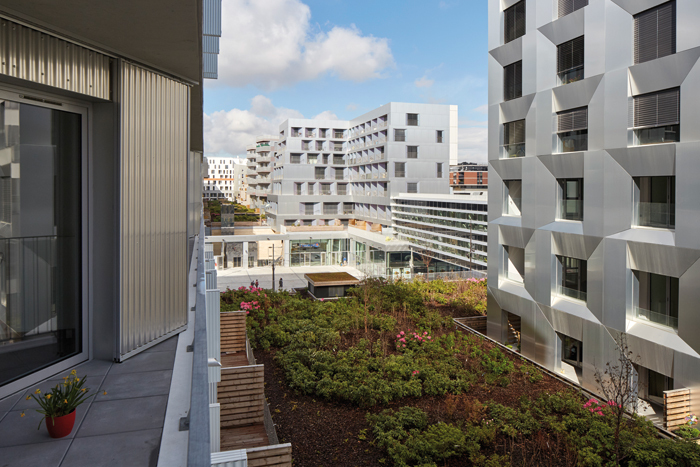 It's not only a radical collaborative exercise in urban regeneration, it also builds on an extraordinary pre-existing megastructure - the longest single building in Paris, stretching along the Boulevard Macdonald. The street is one of the 'boulevards des Maréchaux', named after Napoleon's First Empire military marshalls, in this case Étienne Macdonald (1765-1840). The area was an industrial hinterland. Gasworks occupied the site until the 1950s, and to the south, a band of railway viaducts, beyond which the Cité Michelet rose in the 1960s - nineteen 19-storey social housing towers marked by white fork-banded facades. 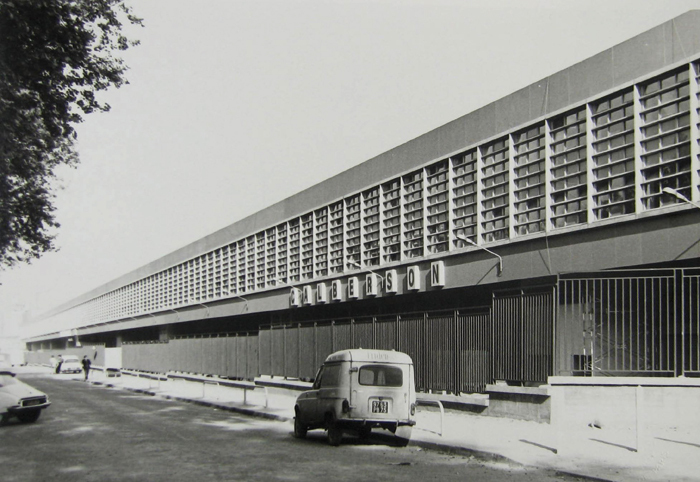 In 1964, Calberson, a freight division of SNCF (French Railways), commissioned industrial architect Marcel Forest to design a vast new warehouse on 5.5 hectares squeezed between railway and boulevard. The land was decontaminated and the Entrepôt Macdonald emerged in 1970. 16m high and a surreal 617m long, the 142,000 sq m megastructure was distinctly modernist, yet its horizontal stratification, which Forest pictured like a mille-feuille pastry, rejected contemporaneous urban verticality. The Entrepôt Macdonald roof became the place where the Paris police took impounded cars - it could park over 1,500. As the century turned, Paris turned its attention to edgelands like this, looking to renew and re-integrate them into the city. In 2006, the Entrepôt Macdonald was put up for sale, and the city in partnership with developers acquired it. 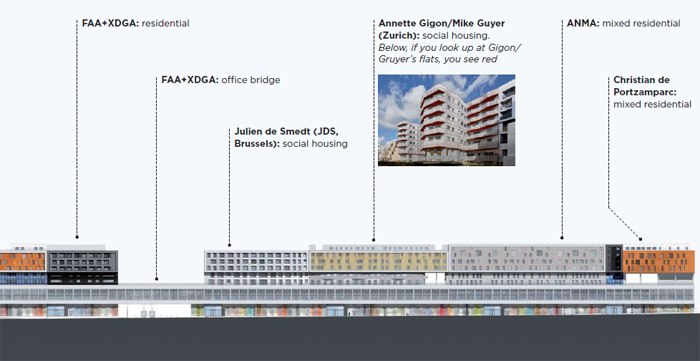 In 2007, OMA's Rem Koolhaas and Floris Alkemade worked up a masterplan for the Entrepôt. OMA initially considered high-rise, but the site was not zoned for it. The plan envisioned drum-shaped volumes rising above it, but crucially, it specified two things. First, the preservation of Forest's unfeasibly long first floor - this was 'the key to the identity of the project', says Alkemade, now the Netherlands' chief government architect. Secondly, a strongly stratified look by specifying layers as crystal (glass) in the first two new storeys, recessed to make a full-length terrace along Boulevard Macdonald, and mineral in the top three storeys. 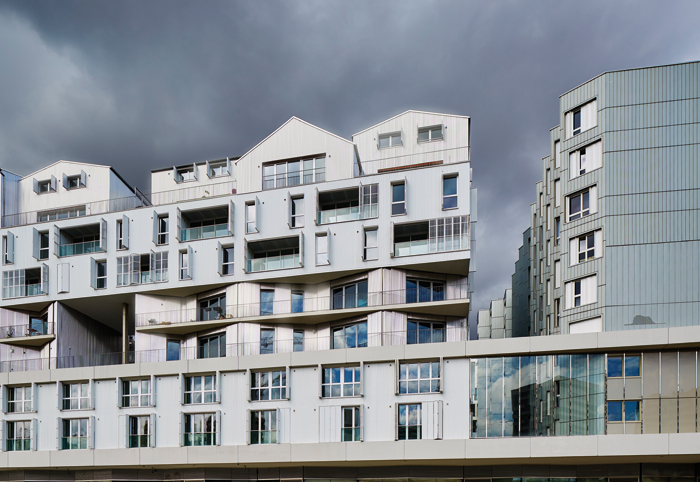 In 2008, Alkemade's practice FAA developed the architectural concept with Brussels-based Xaveer De Geyter Architects (XDGA), whose Milena Wysoczynska became project chief. The plot was divided into sections to build in and above the existing structure. 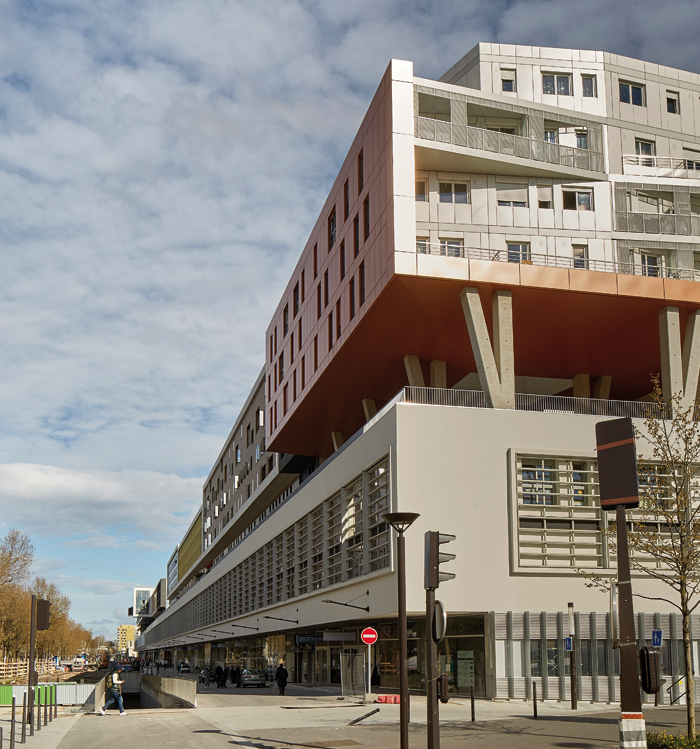 Fifteen, mainly Paris-based architects were appointed. Works began in 2010. The first floor was fragile, and parts had to be replaced. The extra load of newbuild above required jet-grouting to reinforce piling 10_12m-deep. The superstructure was complete in 2012, when the new tramline T3 was opened, threading under the first floor in a new opening called Passage Susan Sontag. The first parts were opened in 2014. 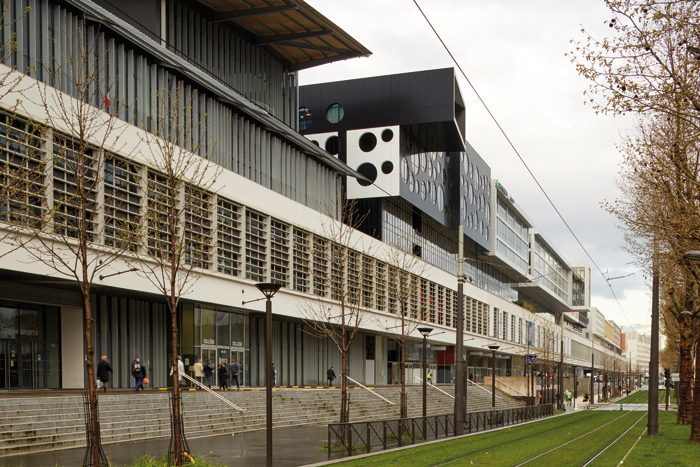 Last year, across the new esplanade to the south, SNCF opened the Rosa Parks station building with a fast RER connecting to the central Gare St Lazare in just two stops. The reborn Entrepôt Macdonald is really two halves, connected by the first floor which becomes a bridge above the tramway, preserving the never-endingness of Forest's grille facade along the boulevard. Newbuild rises up to six storeys above the old Forest element, eight storeys high behind it on the south. The western half is all residential, mixed 50_50 social and private. An open axis cuts a trench down to the first floor, between adjoined volumes on the north and separated blocks on the south, with a long zig-zag of glazed ground floor for retail. The eastern half is mixed use. Beneath it all is a vast two-level underground car park with 1300 capacity. In all, 165,000 sq m of space include 1,125 residential units covering 74,300 sq m, and 58,500 sq m of office and commercial space. At the eastern end, a college and sports centre has been designed by Kengo Kuma, who has a Paris office. Kuma is masterful in wood, examples including the sublime stacked Asakusa Tourism Center, Tokyo (2012), and he deploys it here in a floating roof canopy. It slopes down to the east, like the nose of a TGV, the rest of the Entrepôt behind it. The roof is actually a folded U-shape exposing plywood structure underneath, and within it is a courtyard, towards which metal strips slope down from five storeys below. The practice says the roof 'may be considered a violation of the [OMA masterplan] rules' and critiques 'the OMA (Western) style of design where two elements are in conflict'. Sure enough, the college quietly subverts the megastructure's blockiness, and is the most angular of the Entrepôt's elements. Next along is a start-up incubator, called CARGO, by Studio Odile Decq, a Blueprint Award 2015 winner for its dramatic black house in Saint-Ange. 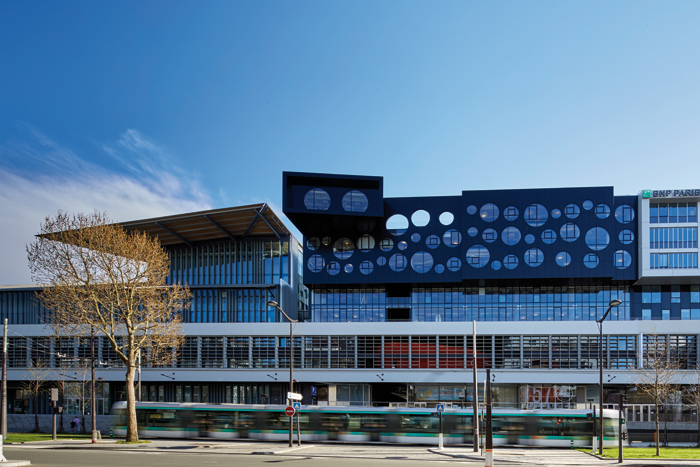 CARGO is a visual stand-out on the entrepôt's north-face: a three-storey stack of black box volumes punched with circles, mostly windows. A slightly skewed top-level volume cantilevers forward, echoing their Saint-Ange design. Below are the two glazed 'crystal' floors, then that Forest's grille continuum through which their café shines red at night. On the south side, the facade is white. 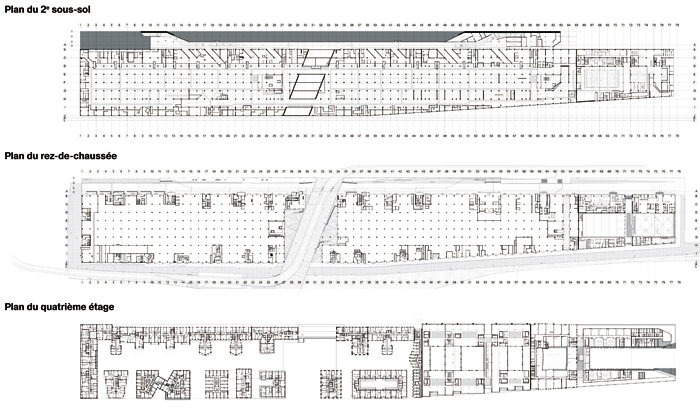 Next is the longest section, by Francois Leclerq and Marc Mimram, over 100m long and packing a hefty 27,000 sq m of offices (as much as London's Centre Point) for BNP Paribas. It looks bland and sterile on the outside, but inside, the bankers enjoy an airy transverse atrium and enclosed garden squares. The narrowest section is next: l'AUC architects' 147-unit student digs, a sliver just eight metres wide but about 50m deep north-south, and bulging westward in the middle with a metal-skinned, saw-tooth profile, which terminates the open east-west axis. As with CARGO, it cantilevers a box out over the north. The next section along the boulevard is Christian de Portzamparc's, consistent with his huge block-end which we shall come to. Next is a mixed use part, from FAA and XDGA. 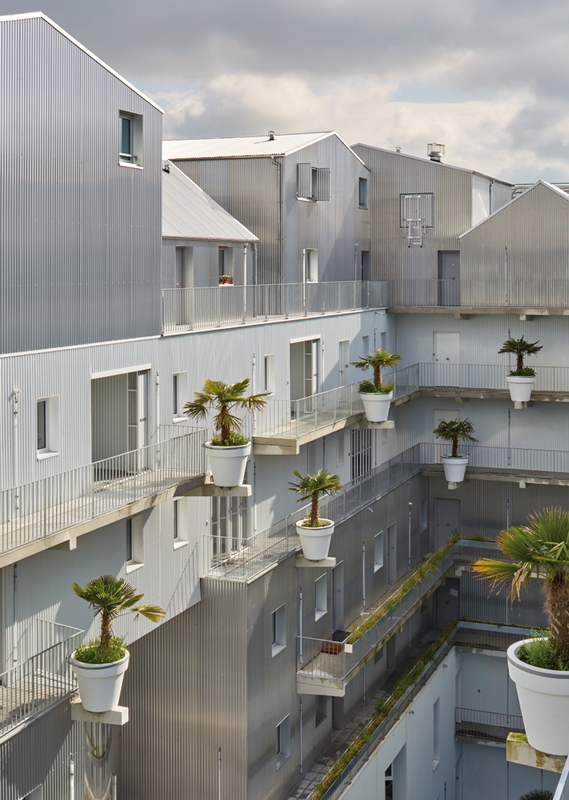 Housing blocks, on the north and south sides, are characterised by facades of big repeating square metal window frames. Their work also includes the two-storey bridge under which the tram passes, containing offices. In the western half, three long housing blocks slightly vary the continuous boulevard facade. Then comes the wrap-around end section by 1994 Pritzker Prize winner Christian de Portzamparc, whose works include the massive, monumental yet soft Cité de la Musique (1995), Paris, and the graceful One57 supertall in New York (2014). His solid Entrepôt upper floors present a red earthy facade, but as the block turns the corner, the red becomes a strip along the 69m-wide west end, separating aluminium facades -- four floors with gentle zig-zagging facades, and two blue floors, recessed above a shorter stretch of Forest's grille. De Portzamparc says the composition is 'a discussion of colour and material'. Around on the southern side are a parade of residential blocks separated on their upper floors. Many surfaces are metallic. 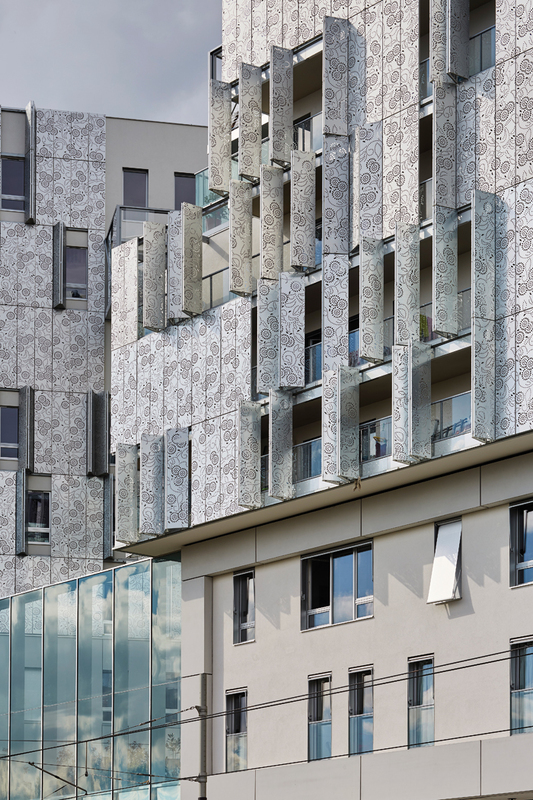 Exquisite patterns have been perforated into the metal elements of the connected Brenac & Gonzalez twin blocks. But more design variety (with form, balconies etc) is internalised into the central open axis, only visible to occupants looking out, which although planted, lost the opportunity to create a walk-through linear garden. 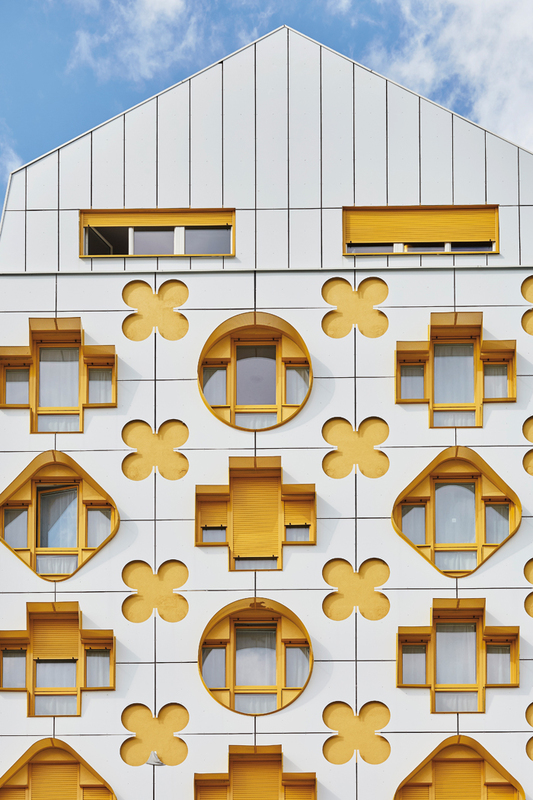 The stand-out block is by Stéphane Maupin - a white seven-storey mini-tower above the retail base, marked by golden four-leaf clovers and windows in golden crosses, diamonds and circles. Its facades are as fun and striking as if by FAT. Is the Entrepôt Macdonald a 'horizontal city', as numerous mixed-use skyscrapers claim to be 'vertical cities'? Both are illusions, because neither can function in isolation. Perhaps it is more like the super-scaled, sectioned wall city imposed on the urban fabric of Koolhaas' conceptual Exodus of 1972? In it, 'voluntary prisoners' in 'a strip of intense metropolitan desirability' (set in London) are controlled and isolated from the outside world. That interpretation, with parallels to Ballard's (out-of control) High-Rise, seems too dystopian for Entrepôt Macdonald. It took a half-century to tame the nightmare of Corbusian urban planning and its overpowering, soulless repetition of form, and a quarter-century to start to wake up to human-scaled townscapes with variety of texture and form. De Portzamparc's 'open block' masterplanning of Paris' Quartier Masséna (1995) was a key step, rejecting the big, solid block. 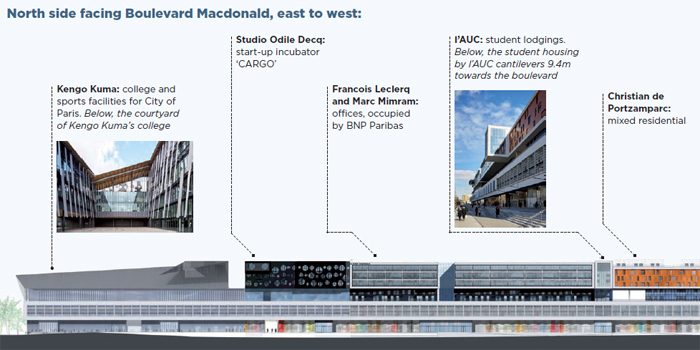 Where does Entrepôt Macdonald sit in this transition? Obviously, it has variety, but human-scaled it is not. The historic linearity of the base along the boulevard is dreamy, but above it, we see a battle between the sheer 'heaviosity' (Woody Allen's word) of the whole and various architects' efforts to express a distinctive character in their slice of it. Different designs, from dull to exciting, have been crammed up against each other and put on show upon a podium platform. On the south side, the heaviosity is broken with gaps between blocks, but without ground permeability (except under the bridge), this is no 'open block'. Despite all this, there is a surprising theatre of motion with the trams, and on the south side, crowds crossing the plaza from Rosa Parks station to pass under the bridge. Successful urban interventions bring life, not silence, to the city, and it is strange that Entrepôt Macdonald may succeed where the architects have had less scope to play - below, rather than above, Forest's unfeasibly long, straight first floor.